Create a design and simulate using EE-Sim® tools: The MAX6955 is a compact display driver that interfaces microprocessors to a mix of 7-segment, 14-segment, and 16-segment LED displays through an I2C-compatible 2-wire serial interface. 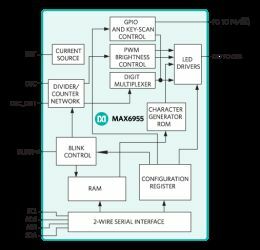 The MAX6955 drives up to 16 digits 7-segment, 8 digits 14-segment, 8 digits 16-segment, or 128 discrete LEDs, while functioning from a supply voltage as low as 2.7V. The driver includes five I/O expander or general-purpose I/O (GPIO) lines, some or all of which can be configured as a key-switch reader. The key-switch reader automatically scans and debounces a matrix of up to 32 switches. Included on chip are full 14- and 16-segment ASCII 104-character fonts, a hexadecimal font for 7-segment displays, multiplex scan circuitry, anode and cathode drivers, and static RAM that stores each digit. The maximum segment current for the display digits is set using a single external resistor. Digit intensity can be independently adjusted using the 16-step internal digital brightness control. 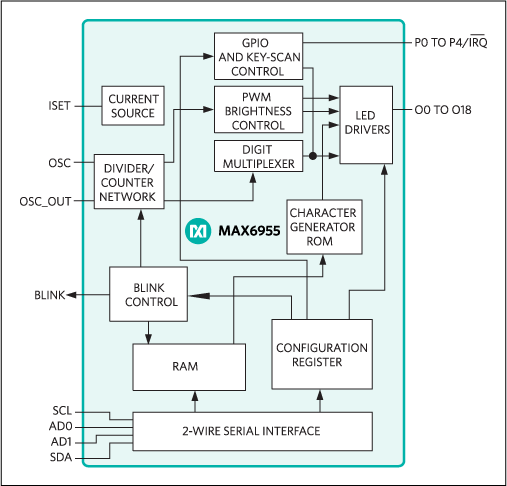 The MAX6955 includes a low-power shutdown mode, a scan-limit register that allows the user to display from 1 to 16 digits, segment blinking (synchronized across multiple drivers, if desired), and a test mode, which forces all LEDs on. The LED drivers are slew-rate limited to reduce EMI. For an SPI-compatible version, refer to the MAX6954 data sheet. An evaluation kit (EV kit) for the MAX6955 is available.